A pair of North American Beavers scratch themselves on the banks of the Skagit River in Washington State. One of the beavers finishes and swims away. Two North American Beavers on the bank of Skagit River in Washington State. A pair of North American Beavers scratching and grooming one another on a river bank. Located in Washington State, on the Skagit River. Beavers eat in water dams on background of dry logs and trees in Ushuaia. Hardworking builders. Amazing world of wildlife. Unique nature. 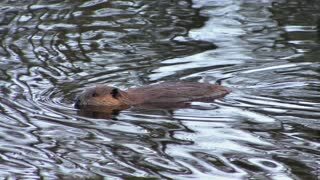 Beavers in water dams in Ushuaia. Hardworking builders. Amazing world of wildlife. Unique nature.